Professor Malcolm Johnson is a busy man. Since this summer’s broadcast of Channel 4’s ‘Old People’s Home for 4 Year Olds’ – which brought together on camera a group of lively toddlers with elderly residents at a care community and which returns this week for a Christmas Special – he’s been bombarded with emails, phone calls and invitations from an eager public keen to find out more and learn from this unique experiment. Over two one-hour episodes earlier this summer we saw the heart-warming results of an experiment designed to tackle increasing isolation of older people in our communities by pairing 11 residents at St Monica Trust in Bristol with 10 pre-schoolers. Whilst the impact of young children and older people sharing daytime care facilities had already been shown to be generally positive, this was the first experiment in the UK to measure the impact of intergenerational interaction on health and happiness of the older group. Alongside physiotherapist Dr Melrose Stewart and geriatrician Dr Zoe Wyrko, Malcolm - whose research focuses on gerontology and end of life care – was part of the expert team enlisted to study what happens when you pair the two groups over a six-week period. At the start, elderly participants were measured on cognition, mood and depression, as well as their physical abilities including balance and ability to get up and walk. These measurements were taken again midway through and at the end of the programme. “We put the older people through a series of well-established tests and some newer ones, but we essentially brought to bear what we know are good ways of assessing the various dimensions of the health condition affecting older people” he explains. The team designed and carried out a six-week programme that gave the two generations time and space to engage physically and socially, including through games, walking, activities using craft and art work and culminating in a schools sports day. And their results were significant. After just three weeks there were noticeable improvements in residents’ measurement scores and by the end of the trial 80 per cent of participants showed improvements. On the sports day, one woman who couldn’t remember ever running was seen sprinting off to the winning line with her four-year-old companion. Most significantly, whereas at the start of the experiment nearly all residents identified as depressed, two of them severely, after the six week programme none of them did. Viewers will remember Hamish, at first sceptical of the premise of the initiative and of his own abilities to take part yet, by the end, roaring like a lion on the floor. Malcolm reflects on the motivating power of young people. “Having lost a leg in his teens, Hamish had carried a sense of being somehow deficient for a long time. But young kids do what adults are very bad at, and just asked him about his leg. That phased him and he responded in a totally unpredictable way. 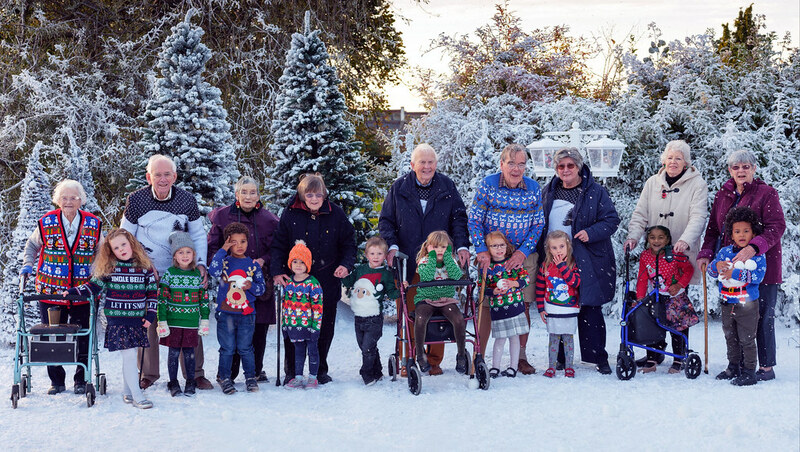 In between making Christmas crafts and preparing for a carol concert, viewers see several of the older people, each accompanied by a child, visiting someone at home who is lonely. As Malcolm says in the programme, “Christmas is unequivocally a festival shared with family and friends and ideally with children. If those kind of Christmases were part of your life in the past and those elements are no longer present, Christmas can be a real challenge. “The subtext is to look at how these older and younger people are enjoying this relationship, but what about these other older people – the estimated 1.7 million – who are truly lonely, are unlikely to see anyone and who would love this sort of connection?” he expands. “Of course, loneliness is not just about being alone. Loneliness can occur when you are surrounded by other people and you can be lonely in a crowd. The only way to dispel the self-inflicted notion of being separated out and not being part of the festivity is to be drawn into some other human activity where you’re sharing what you’re doing with other people. It’s pretty simple stuff, but we don’t do it.” says Malcolm. So does the success of 'Old People’s Home for Four Year Olds' herald a shift in our thinking on end of life care? Already, a number of care homes and nurseries have put initiatives in place to make better connections on a more regular basis to help bridge the intergenerational divide and, from the mailbag of messages Malcolm has received, interest is growing. He likens what’s happened with 'Old People’s Home for 4 Year Olds' with the seminal 1960s BBC documentary 'Cathy Come Home' which raised the plight of homelessness in the UK and led to the setting up of Shelter. “With Cathy Come Home we saw how a powerful television documentary could hit the public between the eyes and bring about change, and in a lesser way that’s what’s happening here” he says. “Old People’s Home for 4 Year Olds pressed two buttons. One, everyone knows somebody in their family who has got old, become dependent or perhaps depressed or isolated. Two, everyone knows that if there are small children around they attract attention because they are so buoyant and non-judgemental and can be lots of fun.